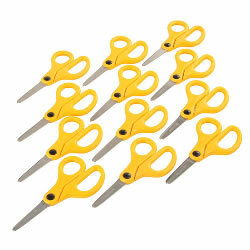 Kaplan's selection of scissors cut paper only, making every art project safe for young learners. 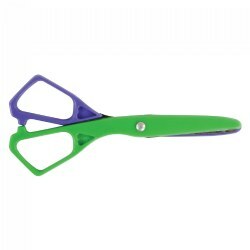 In addition to child scissors, Kaplan offers high quality teacher shears, scissor racks, and crazy shape scissors. 4 years & up. 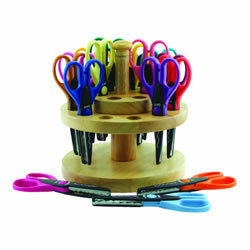 Twelve pairs of 5" blunt tip scissors with stainless steel blade in a convenient scissor stand. Scissors can be used left or right handed. Colors may vary. A spring action scissor looks and operates like regular scissors. They are comfortable and easy for children to use. A simple plastic spring in the handle can be raised or lowered to allow the scissor to operate like a regular scissor or to spring open after a cutting motion like a loop scissor. The double finger bow allows greater cutting leverage for little hands. 5" blunt tip. 4 years & up. 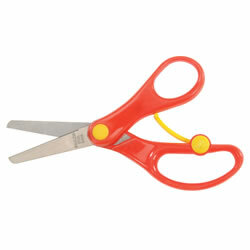 These high-quality, right or left handed scissors have corrosion-resistant stainless steel blades. Colors may vary. 5" Long. Design on handle may vary. 3 years & up. 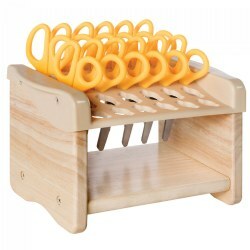 This hardwood organizer has 18 assorted kraft edger scissors. 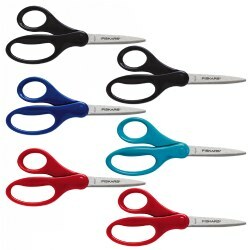 Perfect for keeping your scissors visible and accessible. Patterns included: Large Pinking, Bat Wings, Jigsaw, Lace, Majestic, Heartbeat, Wave, Seagull, Provincial, Sunset, Sunflower, Victorian, Flash, Rockies, Postal, Mini Scallop, Imperial, Speckle. 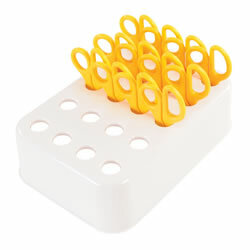 Measures 7 5/8" x 5 3/8"H.
Sturdy wooden scissor holder holds up to 30 scissors. 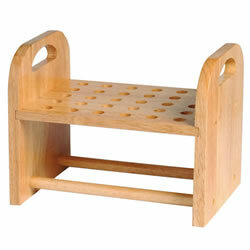 It features plastic top with holes designed for scissors and solid wooden sides and bottom. Scissors not included. Measures 9"L x 6"W x 6"H.
3 years & up. Wooden holder holds 30 pairs of scissors. 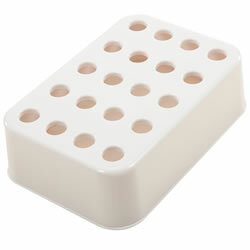 Measures 10 1/4" x 6 1/2" x 8". 4 years & up. 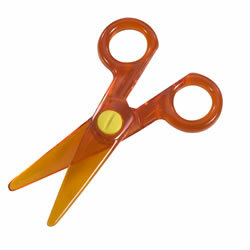 5 1/2" scissors for right or left-handed children. 4 years & up. 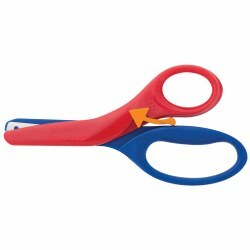 These ultra-light, mini easy grip scissors are super safe and perfect for little hands, left or right. 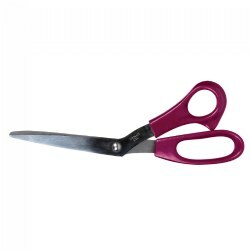 Features: 30 mm round ended stainless steel blade, Blade guard for safe storage when not in use, and a High-quality, easy-to-grip handle with spring action that allows scissors to self-open and keep from snapping. 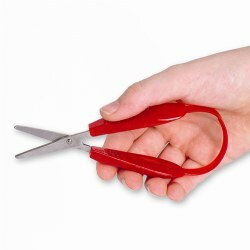 Ideal for early scissor skill development or for children with weak hands. Size: 5"L x 2"W. Purchase as a set of 4 or buy individually. 12 years & up. Designed to put adult cutting performance in still-growing hands! 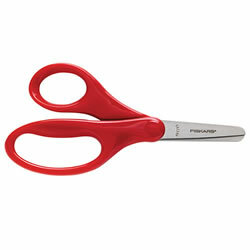 These high-quality Fiskars® Scissors are a must-have essential for school, crafting, and every day use. Features a stainless-steel blade with pointed tip and the grip features an ergonomic thumb loop for comfort and control. Measures 7" Long. Colors may vary. Purchase as a set of 6 assorted colors or buy individually.